Endobronchial involvement is a common feature of sarcoidosis. The mucosa may appear normal or there may be inflammatory changes with erythematous lesions, miliary nodules, and, rarely, mass-like lesions leading to obstruction. In patients with bronchial lesions, the bronchial biopsy may be positive in three-quarters of patients. On the other hand, granulomas may be identified in one-third of patients with a normal mucosa. Current data on endobronchial sarcoidosis is primarily associated with the treatment and prognosis of obstructive mass-like granulomas. Data relevant to clinical features of superficial endobronchial involvement and its implications on prognosis and extrapulmonary organ involvement is lacking. The results of our two previous studies reveal that clinical findings of endobronchial disease may be different. These studies also suggest that there is a great difference between patients with no endobronchial involvement, limited and diffuse endobronchial disease in regard to clinical features, and prognosis. The incidence of extrapulmonary organ involvement is also significantly different between the three groups. In this short review, the clinical findings of endobronchial sarcoidosis have been defined, the effects of superficial endobronchial involvement on prognosis, and extrapulmonary organ involvement. Cuneyt Tetikkurt, MD, declares no conflicts of interest in relation to this article. No funding was received for the publication of this article. In this review, the main aim is to discuss the clinical features of endobronchial disease in regard to prognosis and extrapulmonary organ involvement in sarcoidosis. Endobronchial involvement is not an uncommon sequela of sarcoidosis. Bronchoscopy can provide valuable information regarding the type, extent, and location of endobronchial disease for visible lesions and thereby allows histopathologic confirmation. Even when the airway mucosa appears normal, the diagnostic yield of bronchial biopsy may reach to 30 %. Previous studies have primarily investigated the clinical implications and treatment of bronchial stenosis due to endobronchial granulomas. Few studies have emphasized the functional and bronchoscopic features of endobronchial sarcoidosis but they have not reported the clinical and prognostic consequences of superficial mucosal involvement.3,5,7,12 They included a small number of patients with stenotic bronchial lesions. The authors have provided a broad description, evaluation and treatment options for bronchial stenosis or narrowing due to sarcoidosis. Chambellon et al. have also emphasized the need for early treatment, since a delay in treatment beyond 6 months did not lead to improvement in the lesion.7 Yanardag et al. have defined the clinical features of endobronchial involvement and its correlation with prognosis.9 In these patients, extrapulmonary organ involvement was more frequent compared with patients without endobronchial disease. Pulmonary function tests and diffusion capacity per unit lung volume (DLCO/VA) were not significantly different between the two groups. ACE, serum, and urinary calcium levels were higher than subjects without endobronchial lesions (see Table 1). Endobronchial sarcoidosis appears to be a significant factor for progressive and advanced disease. These patients had approximately four times a worse prognosis than patients without endobronchial involvement. The severe prognosis is probably associated with the high granuloma burden caused by endobronchial lesions. This finding is also supported by the raised levels of serum ACE, serum, and urinary calcium reflecting the high granuloma burden.9 In the Yanardag study, endobronchial lesions did not lead to stenosis or narrowing and were superficial or had a normal mucosal appearance.9 Presence of endobronchial involvement may implicate a severe and a progressive disease. These findings emphasize the significance of bronchoscopic biopsies in regard to prognosis and thereby a progressive disease. The above result is unique because previous studies have reported that only proximal stenotic bronchial lesions would be an indicator of serious disease.3–6,13,14 Endobronchial disease carries a potential risk for progressive disease in sarcoidosis patients in regard to a worse prognosis and a more frequent extrapulmonary organ involvement. Advanced pulmonary sarcoidosis develops in 5–6 % of all patients and radiologically evident pulmonary fibrosis develops in approximately 10 %.15,16 No study has comprehensively surveyed all potential risk factors for persistent sarcoidosis. While no specific risk factors for advanced pulmonary disease have been identified, numerous factors like old age, lupus pernio, splenomegaly, or multiple organ involvement have been defined for progressive and/or advanced disease.17–21 The Yanardag study is exclusive for demonstrating that endobronchial involvement is a significant risk factor for progressive and advanced disease.9 Treatment of sarcoidosis is based on the premise that suppression of granuloma formation results in preservation of organ function and minimization of advanced disease or long-term fibrosis,12,21–23 which may be considered as the supporting evidence for these findings. The prognostic differences between patients may be due to the variable kinetics of granuloma formation in each individual. Tetikkurt et al. 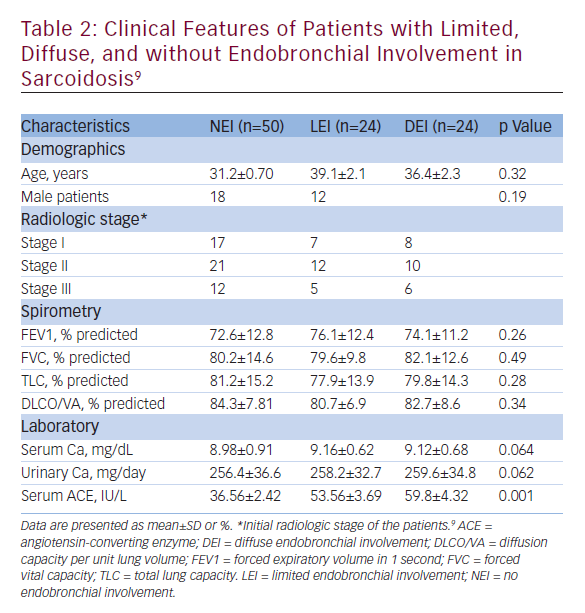 have reported that patients with no endobronchial involvement (NEI), limited endobronchial involvement (LEI), and diffuse endobronchial involvement (DEI) have shown significant differences in regard to clinical features (see Table 2), extrapulmonary organ involvement, and prognosis. Pulmonary function tests, DLCO/VA, serum and urinary calcium levels were not significantly different between the three groups in this study while ACE was significantly higher in the LEI and DEI groups than the NEI group. This finding implicates a higher granuloma burden in the LEI and DEI patients. The prognosis was approximately seven times worse in the DEI group while it was four times worse in the LEI group than the NEI group. Extrapulmonary organ involvement was more frequent and severe in the LEI and DEI group compared with the NEI patients contributing to the worse prognosis. The higher the granuloma burden, caused by diffuse endobronchial disease, in a patient the worse the prognosis is and the extrapulmonary organ involvement is more severe. 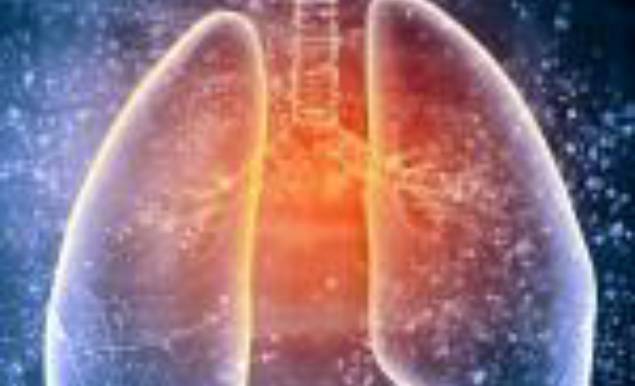 This is supported by the fact that patients with DEI showed the most unfavorable clinical implications compared with the LEI and NEI groups.9 Extrapulmonary organ involvement may also depend upon the burden of noncaseating granulomas in sarcoidosis. 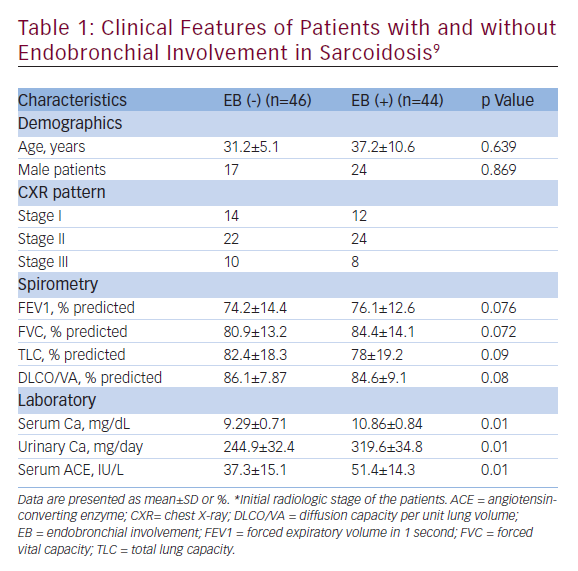 Endobronchial involvement, either limited or diffuse, appears to be a potential risk factor for advanced disease in sarcoidosis. On the other hand, endobronchial disease may also lead to severe organ involvement in sarcoidosis. As bronchoscopic diagnosis of endobronchial lesions is an easy procedure, pulmonologists should routinely use bronchoscopy and obtain multiple mucosal biopsies for the diagnosis of endobronchial sarcoidosis for identifying patients under a potential risk for a worse prognosis. Bronchoscopy will thereby be useful for the diagnosis of endobronchial involvement necessitating a close follow-up for the early identification of progressive disease in such patients without any delay in treatment. In conclusion, endobronchial disease identified by bronchoscopy is a significant determinant of a worse prognosis and severe extrapulmonary organ involvement in sarcoidosis. 3. Shorr AF, Torrington KG, Hnatiuk OW, Endobronchial biopsy for sarcoidosis: a prospective study, Chest, 2001;120:109–14. 4. Corsello BH, Lohaus GH, Funahashi A, Endobronchial mass lesion due to sarcoidosis: complete resolution with steroids, Thorax, 1983;38:157–8. 5. Shorr AF, Torrington KG, Hnatiuk OW, Endobronchial involvement and airway hyperreactivity in patients with sarcoidosis, Chest, 2001;120:886–6. 6. Ianuzzi MC, Rybicki BA, Teirstein AS, Sarcoidosis, New Engl J Med, 2007;357:2153–65. 7. Chambellan A, Turbie P, Nunes H, et al., Endoluminal stenosis of proximal bronchi in sarcoidosis: bronchoscopy, function, and evolution, Chest, 2005;127:479–81. 8. Olsson T, Bjornstad-Pettersen H, Sterjenberg NL, Bronchostenosis due to sarcoidosis: a case of atelectasis and airway obstruction simulating pulmonary neoplasm and chronic obstructive pulmonary disease, Chest, 1979;75:663–6. 9. Yanardag H, Tetikkurt C, Bilir M, et al., Clinical features and prognostic significance of endobronchial sarcoidosis, BJMMR, 2015;9:1–7. 10. Hunninghake GU, Costabel U, Ando M, et al., ATS/ERS/WASOG statement on sarcoidosis: American Thoracic Society/European Respiratory Society/World Association of Sarcoidosis and Granulomatous Disorders, Sarcoidosis Vasc Diffuse Lung Dis, 1999;16:149–73. 11. Lynch JP, Kazerooni EA, Gay SE, Pulmonary sarcoidosis, Clin Chest Med, 1997;18:755–86. 12. Udwadia ZF, Pilling JR, Jenkins PF, et al., Bronchoscopic and bronchographic findings in 12 patients with sarcoidosis and severe or progressive airways obstruction, Thorax, 1990;45:272–5. 13. Petrache I, Moller DR, Mechanism of therapy for sarcoidosis. In: Baughman RP, ed. Sarcoidosis, New York: Taylor and Francis, 2006;671–87. 14. Torrington KG, Shorr AF, Parker JW, Endobronchial disease and racial differences in pulmonary sarcoidosis, Chest, 1997;111:619–22. 15. Baughman RP, Teirstein AS, Judson MA, et al., Clinical characteristics of patients in a case control study of sarcoidosis, Am J Respir Crit Care Med, 2001;164(10 Pt 1):1885–9. 16. Moller DR, Pulmonary fibrosis of sarcoidosis. New approaches, old ideas, Am J Respir Cell Mol Biol, 2003;29(Suppl. 3):S37–41. 17. Bjermer L, Thunell M, Rosenhall L, Stjernberg N, Endobronchial biopsy positive sarcoidosis: relation to bronchoalveolar lavage and course of disease, Respir Med, 1991;85:229–34. 18. Judson MA, Baughman RP, Thompson BW, et al., Two year prognosis of sarcoidosis: the ACCESS experience, Sarcoidosis Vasc Diffuse Lung Dis, 2003;20:204–11. 19. Judson MA, Baughman RP, Worsening of pulmonary sarcoidosis, Curr Opin Pulm Med, 2014;20:508–16. 20. Chappell AG, Cheung WY, Hutchings HA, Sarcoidosis: a long-term follow up study, Sarcoidosis Vasc Diffuse Lung Dis, 2000;17:167–73. 21. Mana J, Salazar A, Manresa F, Clinical factors predicting persistence of activity in sarcoidosis: a multivariate analysis of 193 cases, Respiration, 1994;61:219–25. 22. Baughman RP, Costabel U, du Bois RM, Treatment of sarcoidosis, Clin Chest Med, 2008;29:533–48. 23. Baughman RP, Nunes H, Therapy for sarcoidosis: evidencebased recommendations, Expert Rev Clin Immunol, 2012;8:95–103.